The muscles and tendons that surround the shoulder provide stability and support. 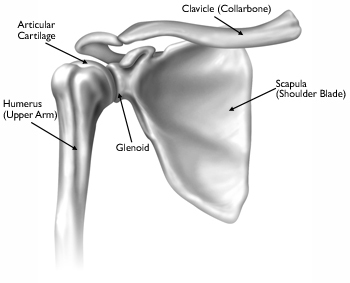 All of these structures allow the shoulder to rotate through a greater range of motion than any other joint in the body. > Failure to substantially improve with other treatments such as anti-inflammatory medications, cortisone injections, or physical therapy. Your orthopedic surgeon will explain the potential risks and complications of shoulder joint replacement, including those related to the surgery itself and those that can occur over time after your surgery. Infection is a complication of any surgery. In shoulder joint replacement, infection may occur in the wound or deep around the prosthesis. It may happen while in the hospital or after you go home. It may even occur years later. Minor infections in the wound area are generally treated with antibiotics. Major or deep infections may require more surgery and removal of the prosthesis.Any infection in your body can spread to your joint replacement. After surgery, you will feel some pain, but your surgeon and nurses will provide medication to make you feel as comfortable as possible. Pain management is an important part of your recovery. Physical therapy will begin soon after surgery, and when you feel less pain, you can start moving sooner and get your strength back more quickly. Talk with your surgeon if postoperative pain becomes a problem. Activity. Exercise is a critical component of home care, particularly during the first few weeks after surgery. Follow your surgeon’s home exercise plan to help you regain strength. Most patients are able to perform simple activities such as eating, dressing and grooming within 2 weeks after surgery. Some pain with activity and at night is common for several weeks after surgery.